Every month, X-Team developers travel to a new place around the world to combine hard work with exploration and adventure. It's a great way to meet other X-Teamers while taking advantage of the freedom that remote work brings. We call it the X-Outpost. 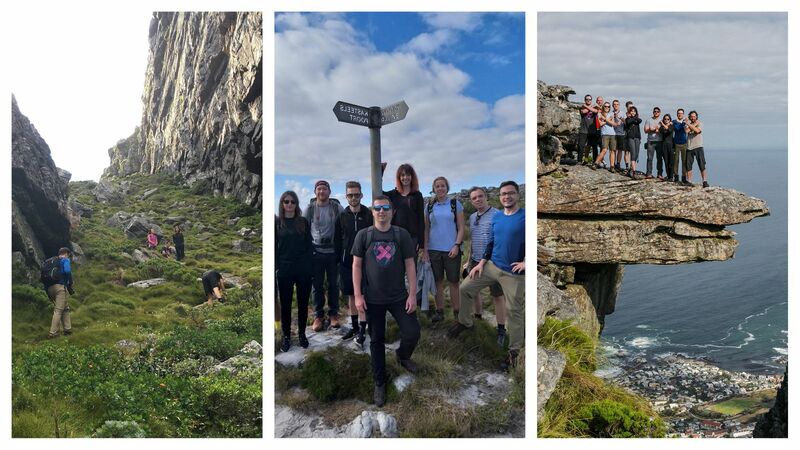 This January was no different: From all around the world, X-Teamers took the plane to explore and enjoy the iconic city at the southern tip of Africa: Cape Town. While the X-Outpost gives X-Team developers the chance to explore the world, work still needs to be done. That's why having a great place to work from is key to a successful X-Outpost. Luckily, we were spoiled for choice in Cape Town. The main co-working space we used during our stay was Workshop17. A great choice, considering it's located alongside the V&A Waterfront and has a view over the Table Mountain. Seeing the clouds pour over the mountain to form the famous tablecloth was particularly memorable. There were also plenty of great places to shop and eat nearby, which made it easy to get an idea of the city without having to travel far at all. Our second office wasn't quite as traditional as Workshop17. It involved a two-hour commute, which would usually be considered unpleasant. Not here. 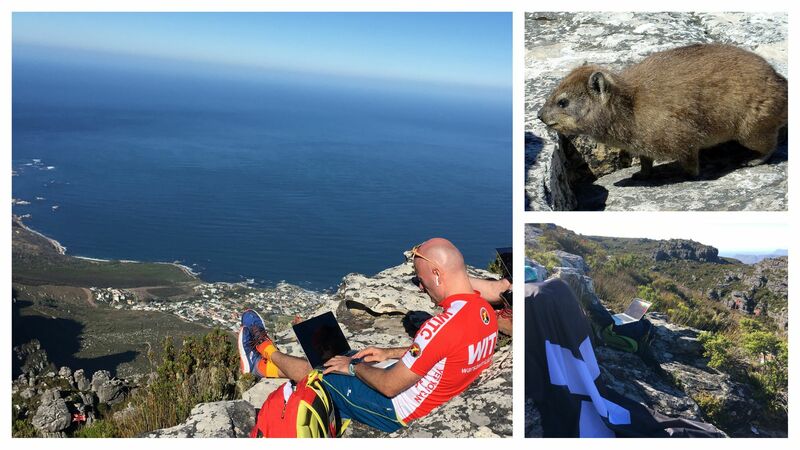 We packed our bags with our laptops, water, and snacks, and at 6:30 AM we headed towards Platteklip Gorge, the most direct hike to our office on top of Table Mountain. Hundreds of stone steps later, we reached the top and took in the stunning views before we started our workday. The Atlantic coastline spread out a thousand meters below our feet. We couldn't help but appreciate the freedom of being able to choose where to work. As the day progressed, it became quite hot (summer in South Africa, after all) and the rocks became a little less comfortable. So we retreated to a WiFi bar at the top of the cableway to continue our work. We punctuated our day with short walks on top of the mountain to say hello to some curious dassies. Weird fact about these animals: while they might look like short-eared rabbits, apparently they're biologically closest to... the elephant 🐘. In every X-Outpost, the Guardian (i.e. the person who takes care of everything and who's usually from the country being visited) organizes an activity that highlights an exceptional regional feature: an Epic. Our Epic took us back to Table Mountain for a hike among the unique fynbos vegetation of the Cape floral kingdom. It was a part of the mountain that we hadn't yet seen, and it was both leisurely and educational. We had a local guide who shared her knowledge of the fauna, flora, and general history of the mountain. We started at the top of Camps Bay and headed along the pipe track to the start of the Woody Ravine, which is a shaded route significantly less crowded than some of the other routes. We also encountered a plant called the Blister Bush: this plant is phototoxic, which means its leaves become toxic when they're exposed to light, causing a severe skin reaction. You can be certain we were very careful not to touch it. After a couple of hours climbing, we reached the top and ventured onto a boulder that juts out (precariously) over the Kasteelspoort gorge, for some photos. Then, after a short walk to the reservoir, we made our way down and eventually enjoyed a well-earned braai (our kind of BBQ) on the beach. Our second week took us to the valley of Hout Bay, a 25-minute drive from the city center along a scenic coastal route. Instead of co-working spaces, we chose to work from a variety of nearby restaurants and cafes, each with their own distinctive character. It can't be too busy. Otherwise, you end up feeling guilty taking up space for a prolonged period of time. There have to be quiet corners where you can take a call without anyone disturbing you. It should have a distinctive vibe that makes it fun to work from. This can come through decor or through views. It should have excellent WiFi, although it's not an absolute necessity if you have a good mobile data plan. Monday: the Vine. This ended up being the regular breakfast spot for most in our group. It's also a popular stop for runners and cyclists after their exercise routine up the coastal road. Tuesday: the Lookout Deck. This one's right on the edge of the harbor, with seals swimming past and views over the bay towards Chapman's Peak. Wednesday: the Green Vine at Silvermist Vineyards. This overlooks the vineyards of Constantia, with a menu carefully put together to highlight the finest, locally sourced ingredients. Thursday: the Moyo Restaurant at the Kirstenbosch Botanic Gardens. The greenery of the gardens stand in contrast with the dramatic mountain, making this a special place to work from. The restaurant let us sample a variety of African-themed cuisine, from pap 'n wors to bunny chow. Mopane worms too, for the more adventurous. Friday: work from our house. The place we stayed at had spectacular views over the Hout Bay valley. Sometimes, working where you're sleeping can be the best of all options. Our two weeks together were a whirlwind of activities. In the spirit of X-Team, all my X-Teamer colleagues have a drive to keep pushing themselves, whether at work or at play. This group made the most of every moment, whether it was hiking, snorkeling, horse-riding, driving, flying, wine tasting, gin distilling, braaing, or karaoke! Together we laughed, learned, lived, shared. New friendships were formed and others were strengthened. X-Outposts have almost become a rite of passage for X-Teamers, and a great example of what's possible when you step out of your comfort zone to discover new experiences.